Metro Vancouver is doing a count of the number of homeless youth in the region. Apr. 2, 2018 10:15 a.m.
Metro Vancouver’s first ever Youth Homeless Count begins this week. Anonymous surveys will be conducted over a nine-day period at youth centres, high schools, shelters and other youth-serving organizations to better understand the homeless youth population. The count will collect data on the number of young people who are homeless in the region to assist government agencies and organizations in responding with appropriate policies and services. It will also help with understanding the causes and conditions that lead to youth homelessness in the region. The face of youth homelessness is distinct from the adult homeless population. The count is also expected to help increase awareness of the issue. Count events are taking place throughout Metro Vancouver between April 4 and 12. • Richmond: April 4, Richmond Brighouse Library, 7700 Minoru Gate, from 1 to 5 p.m.
Free food, video games, green screen movie and photos, makeovers, and more. • Burnaby: April 5, Burnaby Youth Hub, 4750 Imperial St., from 4 to 7 p.m.
Dinner and movie night, bus tickets, secure storage, and WIFI available. • Coquitlam: April 5 and 6, Coquitlam Centre, 2929 Barnet Hwy., from 10 a.m. to 7 p.m.
Free transit passes and a draw for a new bike. • Maple Ridge/Pitt Meadows: April 5, Greg Moore Youth Centre, 11925 Haney Pl., from 6 to 9 p.m.
Free pizza, entertainment and activities. • Vancouver: April 5, Covenant House, 326 West Pender St., from 2 to 5 p.m.
Free pizza, entertainment, transit passes and more. • Langley: April 10, Langley Youth Hub, 6275 203rd St., from 3 to 7 p.m.
Pizza night and regular drop-in programming. NOTE: There are also counts taking place at North Vancouver’s YWCA and the Broadway Youth Resource Centre in Vancouver but the dates have not been finalized. 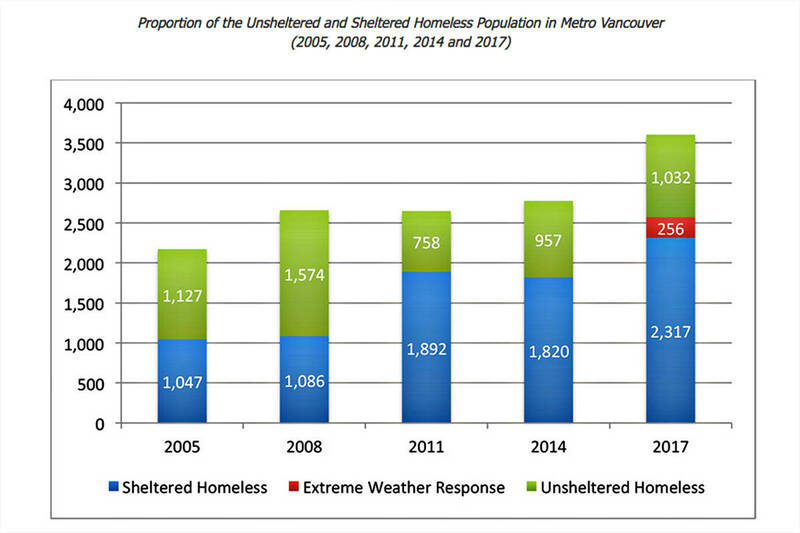 Metro Vancouver created a homelessness task force in 2016, because of the significant rise in numbers throughout the region. There are currently more than 70 homeless camps in the region and Metro Vancouver, with its member municipalities, does counts to obtain information to use when lobbying other levels of government. Metro Van’s homeless action plan seeks to prevent homelessness, help those who are currently homeless and create pathways out of homelessness. • Take the 10-question quiz to find out how much you know about homelessness.